Working right out of his workshop that doubles as his home’s garage, Charlie Hulien has been crafting woodworks for a number of years. Offering a number of different home furnishings and objects as examples on his website, Handcrafted by Charlie is happy to take custom orders for anything clients find of interest. His work is also found for sale during a number of different community events and festivals throughout the Santa Clarita Valley. As a Veteran of the U.S. Navy, Charlie has led an interesting career, dipping his hands into everything from working for Lockheed Martin to working as an extra in television and film. Throughout his vast experiences, however, Charlie always maintained his great interest in working with wood and making crafts. Charlie has built everything necessary for home living like bed frames, dressers, and cabinets. He has also taken to crafting a number of different custom toys and furnishings for children. Having built dollhouses and rocking horses, Charlie also has great experience in building toy chests in a variety of different themes and styles, such as pirate chests and general box styles. Before the children grow any bigger, Charlie has also built many different cribs, changing tables, and easels. Handcrafted by Charlie is also very well-known for his growth rulers built to stand about six feet tall and measure the growth of every child in Santa Clarita and neighboring communities. In further accessorizing homes, Charlie has built a number of different coffee tables, end tables, and bedside tables to accentuate each and every home. Having crafted bookcases, chairs, and display cases, Charlie has even constructed different railings for staircases on more than one occasion. He has even dabbled into creating art and decorative pieces, such as ornamental mushrooms for gardens and carved tree trunks. Having crafted a variety of different designs and crafts, Handcrafted by Charlie has been building handmade furniture, accessories, and crafts for the Santa Clarita Valley for years and continues to do so. 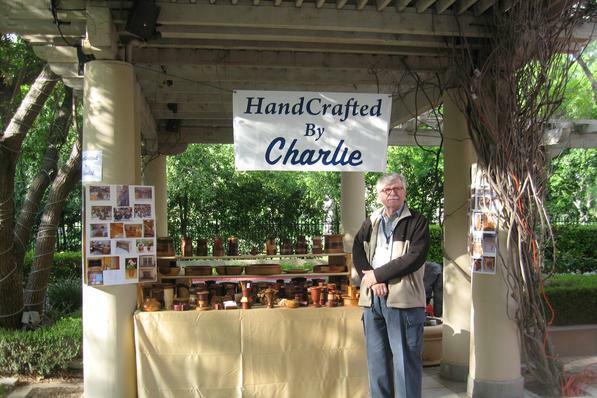 Having built his business up from the ground, Handcrafted by Charlie has years of love and experience in his crafting work, and has been happy to turn his fun and relaxing hobby into a local business for the community.